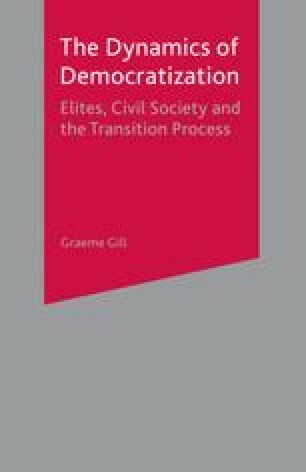 The study of the third wave,1 embodied in the ‘transition literature’, has conceptualized the course of regime change in terms of three phases: regime breakdown, democratic transition, and democratic consolidation. Breakdown involves the deconstruction and possibly disintegration of the old regime, transition is the shift from old structures and processes to new, and consolidation is when those structures and processes have become stabilized and so embedded in the collective consciousness of the society that they gain normative authority. These phases are logically, but not always temporally, distinct; all three phases overlap, even if the forces driving them are not the same. This is clearest in the case of regime breakdown and transition. With domestic political forces the main actors in the third wave of democratization, that process was a zero sum game; democratic forces could not be successful without the withdrawal or collapse of authoritarian power. This does not mean that the two processes, the collapse of authoritarian rule and the establishment of a democratic regime, are the same; the breakdown of authoritarian rule does not inevitably lead to a democratic polity, and historically most cases of authoritarian collapse have spawned further authoritarian regimes.